Club Penguin Cheats by Mimo777 Club Penguin Cheats by Mimo777: Chattabox is coming to an Igloo near you! WOW – you guys sure love pizza! The party was full of pizza fans last week – nice to see that everyone agrees with me when I say "Pizza is THE BEST". How cool is The Fair?! I've spent all week playing on the games and visiting all the rides. My favourite is definitely the Rollercoaster, which ride do you crazy lot love? 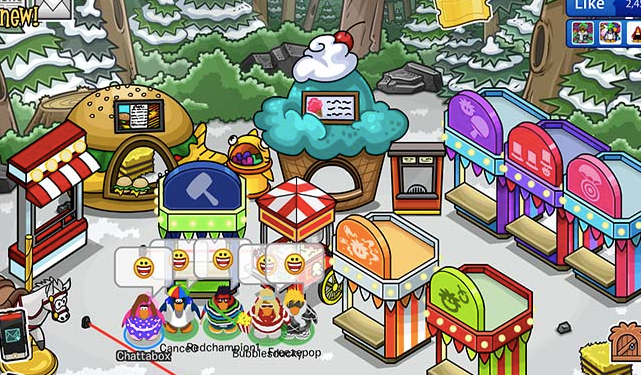 I've also been spending a lot of time visiting "The Fair Igloos", they are looking AWESOME! So this week, lets visit some of YOUR igloos during the party, I can't wait! Incase any of you need some inspiration, I've taken a photo of my "Fair-themed" igloo with a few of my pals hanging out. Plus, we can all earn HEAPS more Fair Tickets to buy super cool stuff – I'm saving up for the Pixel Glasses (remember Penguins, some features require a paid membership). Come dressed in a crazy outfit and bring along your 'game-face' ready for igloo hopping and game-playing – this is going to be a good one! Here's the details for when the next meeting is!